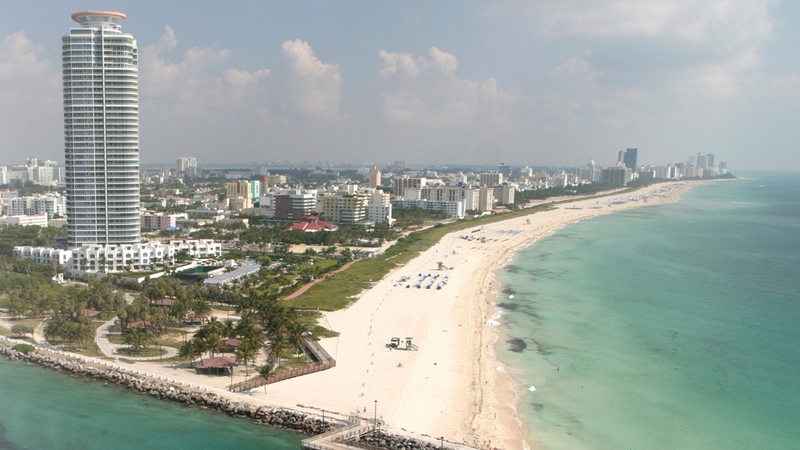 Search for the best flight prices from Manchester to Miami. Compare prices, book today and save money with Manchester Airport. Like nowhere else in the US Miami is infused with an invigorating Latin spirit that consistently draws visitors back for more. Beneath the glorious year-round sunshine Miami provides the perfect playground of style, party culture and miles-upon-miles of sandy beaches, where that truly unique quality of Latin flavour seams to permeate everything from the mouth-watering food and bright, funky architecture, to the glamour boutique stores and luxury hotels. The art deco enclave of Miami Beach is a playground for the rich and beautiful, with a liberal scattering of impossibly luxurious hotels. Five-star Delano South Beach (1685 Collins Avenue) is just a stone’s throw from the ocean, and unique features such as private poolside cabanas, a rooftop spa and sushi bar make it one of the most sought-after places to stay in the area. Downtown Miami is characterised by its upscale skyscraper hotels; including the über-luxurious Viceroy Miami (485 Brickell Avenue) and the less costly but still comfortable b2 Miami Downtown (146 Biscayne Boulevard). Travelling on a budget? Enjoy cut-price luxury just outside Miami at the Hampton Inn Miami Coconut Grove (2800 Southwest 28th Terrace). Miami’s shopping scene is a byword for luxury, with designer stores sprinkled around the seafront strip that runs north from Miami Beach to Bay Harbour Islands. Indulge your inner brand junkie at Collins Avenue just off South Beach, or discover the one-off boutiques and hipster stores of nearby Lincoln Road. At the other end of the strip, Bal Harbour is a glamorous outdoor mall where classic labels such as Valentino and Chanel mingle with exciting new designer outlets. Talking of outlets, bargain hunters won’t regret making the 48km trip to Sunrise north of Miami to explore the largest outlet centre in the USA. Sawgrass Mills (12081 West Sunrise Boulevard) has more than 350 cut-price stores, including American Eagle, Armani Exchange and Burberry. A fusion of Latin, Caribbean and US influences underlies the unique cuisine known in Miami as ‘Floribbean’. Chow down on scrumptious local specialities such as spicy micheladas, pineapple rum cake and frogs’ legs at South Beach restaurant Florida Cookery (1545 Collins Avenue) before unwinding with a classic Miami martini at Haven mixology bar (1237 Lincoln Road). This cosmopolitan city is also famous for its culturally diverse restaurant scene. Enjoy exquisite Indian cuisine at Ayesha’s Fine Dining (14151 Dixie Highway), soak up the relaxed atmosphere at Jamaican diner Island Restaurant & Variety Food Store (10201 Hammocks Boulevard), or sample the succulent steaks at Argentine eatery Lo De Lea (7001 Biscayne Boulevard). This international food and drink festival attracts a star-studded line-up of celebrity chefs. Expect culinary seminars, lectures and tastings conducted by culinary geniuses such as Alain Ducasse, Nigella Lawson and Jamie Oliver. Focused around the Gusman Center for the Performing Arts on Flagler Street, this gathering of film buffs attracts crowds of around 70,000 people. A series of screenings is followed by an award ceremony, with prizes spanning both documentary and dramatic categories. A riotous celebration of Latino culture, this fun festival takes over Miami for 10 days every spring. It culminates with Calle Ocho in Little Havana, the largest block party in the world. More than a million people congregate to watch live entertainment across 30 stages. The highlight of Miami’s summer calendar, this lively three-day festival celebrates the food, music and culture of the Bahamas. Expect incredible costumes, dance displays and riotous gospel services. This international literary festival has been going for around 30 years. The eight-day event draws thousand-strong crowds to downtown Miami for a series of readings, workshops and evenings with top authors from across the world.